In a large bowl, combine the oats, macadamias, almonds and coconut. In a microwave safe bowl, melt the butter, olive oil, honey, and brown sugar. Whisk to combine, until the brown sugar is dissolved. Stir in the turmeric, cinnamon and salt. Pour the liquid mixture over the oat mixture; stir until everything is well coated. Spread the granola on a rimmed baking sheet in an even layer and bake for 30 minutes, stirring once about halfway through. Bake until golden brown and well toasted. After removing the pan from the oven, let granola sit on the baking sheet for 15 minutes. 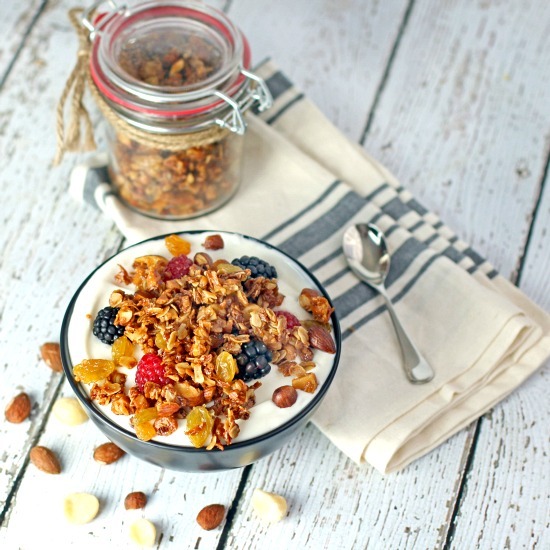 Transfer granola to a large bowl and stir in the golden raisins. Enjoy! 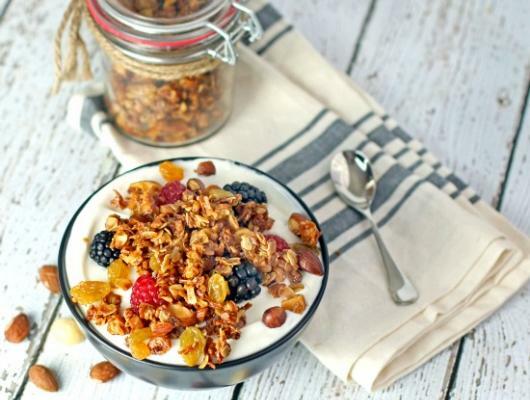 Honey Nutty Granola is an easy, one bowl mixture of 2 kinds of nuts, sweet brown sugar and crunchy, toasty oats…plus one additional ingredient for extra health benefits!